The 6-10 day Outlook gives the confidence (probability) that the National Weather Service has that the observed temperature, averaged over upcoming days 6, 7, 8, 9 and 10 will be in the range of one of three possible categories - below normal (B), normal (N), or above normal (A). 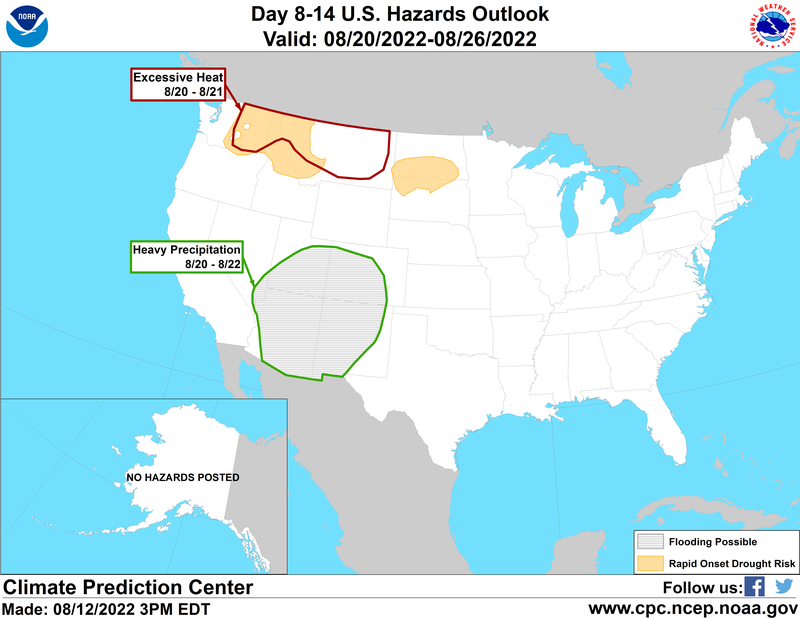 The 6-10 day Outlook gives the confidence (probability) that the National Weather Service has that the observed total precipitation, averaged over upcoming days 6, 7, 8, 9 and 10 will be in the range of one of three possible categories - below normal (B), normal (N), or above normal (A). The 8-14 day Outlook gives the confidence (probability) that the National Weather Service has that the observed temperature, averaged over upcoming days 8, 9, 10, 11, 12, 13, and 14 will be in the range of one of three possible categories - below normal (B), normal (N), or above normal (A). The 8-14 day Outlook gives the confidence (probability) that the National Weather Service has that the observed total precipitation, averaged over upcoming days 8, 9, 10 , 11, 12, 13, and 14 will be in the range of one of three possible categories - below normal (B), normal (N), or above normal (A). U.S. Seasonal Drought Outlook depicts large-scale trends in drought conditions valid for the given season. A discussion on the latest seasonal assessment is also available. 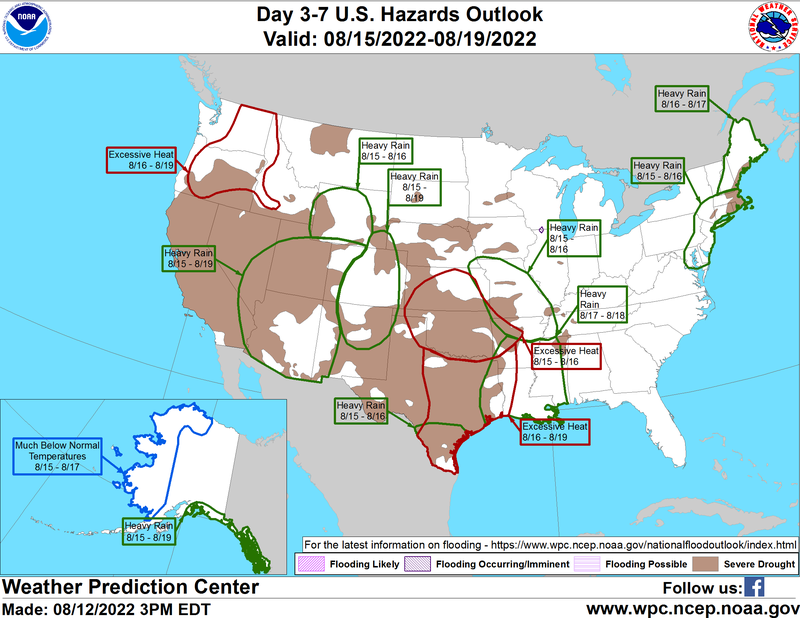 Fire Weather Outlooks provides a map of the contiguous U.S. that highlights areas at risk of threatening fire weather conditions. It is comprised of a Day 1, Day 2, and Day 3-8 forecast. The U.S. Hazards Assessment is intended to provide emergency managers, planners, forecasters and the public advance notice of potential hazards related to climate, weather and hydrological events.